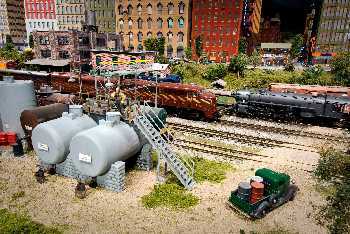 RC Model trains are much more a hobby of artistic display and miniature mechanics than the other RC hobbies. Remote Control cars, boats and planes lean more towards racing or acrobatics. Model trains, on the other hand, chug along around the platform on fixed metal tracks. They are not designed to go very fast, and there is no racing or "stunts" involved. TIP: What does HO stand for? In regards to model trains, "HO" is not a brand or type of model train. It is simply a standardized sizing gauge. HO is the model train scale using a 1:87 scale (3.5 mm = 1 foot). 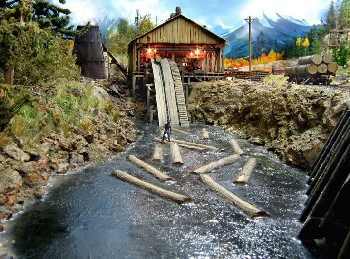 HO is the most common scale of model railway in use worldwide today. If you stick to HO, you will have the largest choice of equipment, and can even find lots of used HO equipment for sale on eBay; if you decide to enlarge your system. If you specify HO, you can be assured it will fit in nicely right to scale with your system. Most of the effort and money in this absorbing hobby is expended towards making a "realistic" but miniaturized landscape for the train to travel through. And some of the HO model train platforms are so detailed and impressive they will just blow you away! 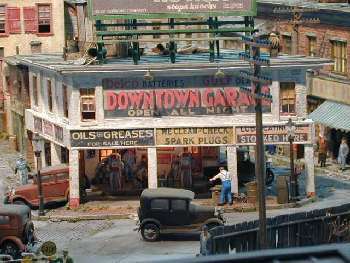 Most HO train hobbyists usually choose a time period in which to set their railroad "village", and craft all elements in the display after how they actually appeared in that era. If careful attention to detail is followed, the historical accuracy can be remarkable. 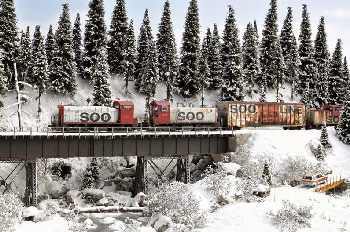 HO model train hobbyists will find a wide variety of locomotive models on the market today. They are made of plastic or metal, and can be bought RTR (Ready To Run) or in kits which require some detailed assembly. Modelers also choose which type of power their system will "prototype"; such as steam engines (from 1870 to the 1940s), diesels (which are still in use today), and electric-powered trains, which were popular in the busy northeast corridor of America. As far as actually powering up today's model trains, the most commonly used is the "can motor", which is concealed, runs very smoothly and uses little current. 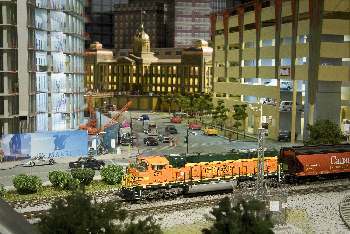 Model railroads use different size rails, depending on the trains that run on it. Many kits use "flextrack", short pieces of track, which as the name implies, can be bent (within limits) to fit the display as desired. The platform the train rides on is usually raised to waist-level and supported by a lumber and plywood foundation. "Ground foam" is used to represent grass, soil and other foliage. You can also make rock formations out of plaster of paris, using forms which you can buy. The sky is the limit when planning and creating your own HO model train landscape scene. Check out some more beautiful displays below. There is almost a science involved in HO model train building, with a language all it's own. You can get very involved in this sport, and it's beyond the scope of our little page here to explore the subject in depth. 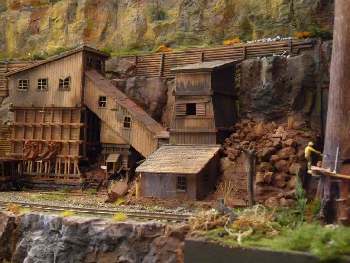 There's tons of books available to help you dig a little deeper and understand how these fantastic railroad villages are constructed, before you start building your own. This book was recommended for beginners on several model railroading forums. Although the author built his model in "N" scale, the content applies to any scale, including HO. 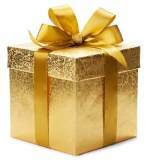 Read about slot cars on this page: Remote Control Hobbies. What about RC airplanes or RC boats? Get up to speed on the hottest new RC sport! Visit Drones 101.